This weekend we were among the thousands of people to attend the sand sculpture festival in Busan. 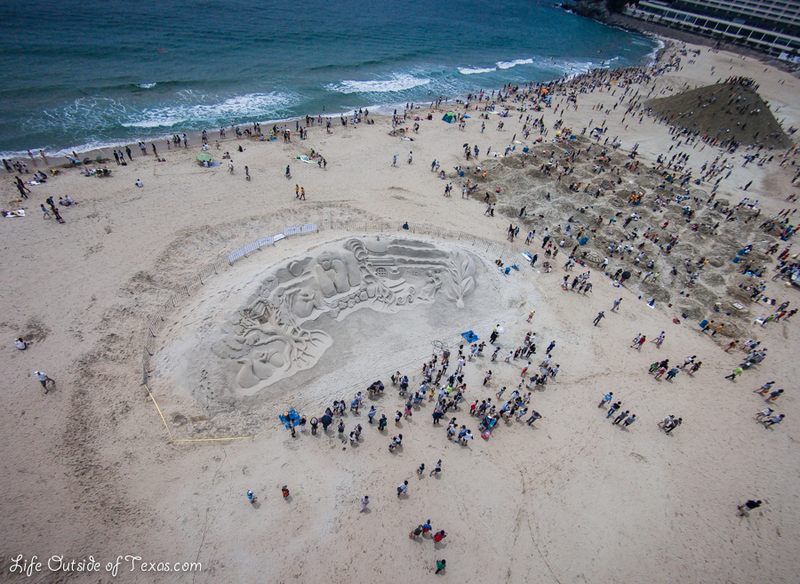 Artists from all over the world came to create amazing sculptures out of the beautiful sand from Haeundae Beach. The detail of the sculptures was really incredible! There were also a lot of hands on activities at the festival, including a whole area for people to create their own sand sculptures. And there was even a giant mound of sand for people to climb on! I just loved watching all of the kiddos having the time of their lives up there. And the families joining hands to make it up the steep hill together was heartwarming. If you’re looking for things to do in Busan, the annual Haeundae Sand Festival is a great activity for people of all ages. Be sure to add it to your Korea Bucket List! Like most festivals in Korea, it’s best to arrive early. The beach gets extremely crowded as the time ticks by… and parking and traffic become a huge nightmare! And don’t forget your sunblock! This entry was posted in Festivals in Korea, Summer and tagged busan haeundae, busan things to do, busan travel, dynamic busan, Haeundae Beach, haeundae beach busan, international sand sculpture festival, sand castle competition, sand festival, sand sculpture festival, things to do in busan south korea by Meagan & Dave | HappilyEverExpat.com. Bookmark the permalink. They were all incredibly detailed. It makes me so envious of their talent! And I loved watching the kids have fun, too. This place looks awesome, a bit jealous we didn’t go this weekend. But may be coming up this coming weekend. Nice photos! That aerial shot is pretty cool! Thanks! We have a quadcopter with a camera and have been having a lot of fun flying it and taking photos. Hope you were able to make it down to Busan and enjoyed yourself. next time you’re down this way, let us know! Wow, those are awesome. I wish I had even just an ounce of their artistic ability. I wouldn’t even know where to begin. Thanks! I wish I was artistic too. Sand sculptures are really interesting too… how does one really get into that? It’s pretty cool though! The festival is certainly one of the more interesting in Korea. I love the sand carvings each year. As cool as they are, what I really like are the ssireum events. Give me some good old fashion wrestling any day. I also haven’t quite got the Korean “beach culture.” not enough fun in the surf for me. I’ve never been to a ssireum event, but it sounds cool! If you know of any matches going on, let me know. I’d love to try to catch one. It was a really cool festival, Nana. We really enjoyed it. Dave got a lot of attention when he was flying his quadcopter (a helicopter with 4 propellers and a camera attached). We also met a really cool Korean guy who had an octocopter that takes professional videos. Fun day! I didn’t make it this year or last, but saw the sand festival three years ago. It was awesome! Some great performances on the stage as well. You got some great shots, I really like the birds’ eye view you captured. We got the aerial shot with a quadcopter with a camera attached… Dave’s new toy. It’s a lot of fun! The weather wasn’t great so they were a bit late putting the stage up this year. It was still really interesting. Wow great place for a quadcopter!! haha I’d like to see more of those pics sometime. We’ve gone to this festival the past couple years but skipped this year. It’s a shame cause this year it looks a lot more artful than the last! 😀 You captured some great pictures as always. Dave has been slow to edit any of the videos together, and I have been slacking on editing the photos. Once we get our stuff together I’ll show you some of the shots. I had no idea Busan had this kind of festival. Too bad I haven’t been able to get down there but only twice in my life. I’ll have to plan a trip down there for the next one. Those sculptures are incredible. Thanks for sharing. You definitely should check it out. It’s a lot of fun. haha Seriously! We actually talked to the artists of the sculpture from the first photo. They were a really nice Italian couple. It’s a shame you were sick. Hope you’re feeling better now! Meagan, Those sand sculptures are amazing. I love the leopard. Busan has such a great beach, doesn’t it? I was so impressed by all of the detail. I love that Korea has all of these festivals. I spoke to the Italian artists and said that the scale of the Busan festival was much larger than one they had done in California, which surprised me. Haeundae Beach is really great. That looks amazing! I can’t believe the detail. Thanks, Jessi. Korea is amazing and I’m so happy to share my experiences with everyone. Hi Meagan, just wondering what kind of drone you have! Do you use a GoPro with it? Thinking of getting one for the boyfriend but don’t really know about different models or anything! Enjoy your new drone! Can’t wait to see your photos. Awesome, I’ve never seen it, but I’m so putting that on the calendar now! I suggest that you also try the Mud Festival in Boryeong City. Thanks! We actually went this year and had lots of fun. Pingback: Busan: Books, Beach, and Basement Cinema | S.K. in S.K.